If you have ever heard Dr. Martin Luther King’s “I Have a Dream” speech it is impossible not to be stirred and feel that you are listening to something epic. It is as if that speech was not mere words. It was a spiritual experience that broke a yoke off the necks of millions of people. I always thought that when I heard it I was reminded of some of the most moving sermons I had listened to in my life. King was a preacher before he was a civil rights icon. And he knew what it meant to be inspired by God to action. And when I heard a recent TV show exploring the story behind King’s famous speech, I knew that I was right. Those were not mere words. On This Week with George Stephanopoulos, Congressman and civil rights leader, John Lewis, spoke about that day. ABC News journalist Byron Pitts spoke with Lewis and former U.S. Ambassador Andrew Young, one of King’s top aids, about King’s speech. This transcript is incredible. Andrew YOUNG: He was determined not to speak more than 10 minutes. And he did. He finished his prepared address in just about 9 minutes. PITTS: But he wasn’t finished. Sitting behind Dr. King was famed gospel singer Mahalia Jackson who shouted to her friend, tell them about the dream. It’s a theme he’d used before in smaller settings. KING: I still have a dream. It is a dream deeply rooted in the American dream. PITTS: Why do you think he made that transition to talk about the dream? YOUNG: As a preacher, there’s something we, we call being led by the spirit. LEWIS: The spirit told him to lay that paper down and just go for it. KING: I have a dream. My four little children will one day live in a nation where they will not be judged by the color of their skin but by the content of their character. I have a dream today. PITTS: And it’s a dream that still lives on 50 years later. This transcript clearly shows that the Holy Spirit inspired one of the most incredible political moments of the last 100 years. When people ask, “Where is God with all this injustice in the world?” I can point to moments like King’s speech and know that God’s Spirit stirs mens’ souls. The Holy Spirit moves behind the scenes, and one day, we will realize that the Lord was in those moments after all. I am not surprised that the Holy Spirit breathed life into words that King had said at other times without the same effect. It was the power of the Spirit that made those words electric. He is moving in history. We just have to see it and know that the Spirit brings the fire that changes history. I don’t say this in any way to disrespect King’s impact or his personal sacrifice to gain what he fought for. While those were his words, the concept he fought for is deeply rooted in the vision that the Apostle Paul outlined in the New Testament. Primarily, I am pointing out that King was divinely inspired, which should give more credence to his dream. Praise be to God that we have come so far because Scripture says, “Where the Spirit of the Lord is there is freedom.” May we continue to bring God’s principles of love, hope and mercy to those who are not free or struggle due to injustice. While our job is not done, history shows that we have come a far way in establishing liberty and freedom in many places in the world. How Patriotic Is Your Bible? Thomas Nelson Publishers has released a New Bible called the The American Patriot’s Bible. It combines the New King James with patriotic commentary that attempts to imply associations between the American story with the Biblical narrative. Any special interest Bible risks misapplying the Scriptures. Critics contend that this Bible takes that concern to a whole new level. I have not read it and will withhold judgment until I do. One thing I will say is that readers tend to look at commentary notes as if they are part of Scripture or at least authoritative. But that is not the case. Even translations are in an essence commentary because you can’t make a translation without adding some commentary in the process. In translating, you have to make word choices and reconcile differences between major manuscripts. Very few people read the original languages and judge the meaning of the text itself. Plus, we may know the words and not understand the nuance of the ancient context in which it was originally written. This new patriotic Bible points to a major concern for those focused on Scriptural purity. The more stuff we add to the Bible, the more cloudy the core of the text may become for the average reader. We have all these “helps” and special resources today. Yet, society is less aware of what the Bible actually says than ever before. If we are supposed to be a Christian nation, why do so few know much about the Bible? Sixty percent of Americans can’t name five of the Ten Commandments. That’s a failing grade in my book. See this article from 2007 to understand just how little we know. Here is what the Out of Ur blog had to say including a critique of the new patriotic Bible. I am all for being a patriot, and I am a very proud American. However, I think that all these special interest Bibles may lead to confusion and get in the way of a clear understanding of Scripture. Thomas Jefferson. James Madison. John Adams. Benjamin Franklin. These men shaped the framework of America’s laws, constitution, and government. But we may never have heard of these men and their revolutionary ideas if it hadn’t been for a Jewish man who lived thousands of years before they did. I am talking about Moshe (Moses) who led the Israelites and developed a set of laws that were remarkable for their day. Many of the ideas that we find in our modern sense of democracy have their roots in the Torah, especially Deuteronomy and Leviticus. There is no parallel in antiquity to the laws outlined by Moses in Deuteronomy. Other legal traditions resembled vassal treaties where the kings set the laws without much focus on protecting the rights of the everyday person. In Deuteronomy, God is the law giver through His prophetic leader – Moses. The laws were written to “all Israel.” Deuteronomy 10:17-19 insists that there should be no favoritism. This meant “due process” and equality under the laws should exist for everyone. This is remarkably close to many of the ideas we find in the American legal system. The Torah focused on the importance of protecting the rights of the widows, orphans and resident aliens. It prescribed case law that regarded property rights and everyday problems in an agrarian society. Some of the laws may seem archaic by today’s standards. But we have to understand that the laws of ancient Israel were remarkably progressive for their time. This reveals that God is long-suffering in molding His people. He knows that there is only so much progressive change that we as humans can endure at one point in history. Change is a long process. Deuteronomy shows an understanding of the potential for the abuse of power by a king. Moses established in Deuteronomy 17:14-17 that the power of the king should be limited. Any king should not stand above the laws. He simply ensures that they are followed. This pasage even hints that the priests are responsible in ensuring the documents that the king will use to guide his rule. The Hebrew Scriptures demonstrate a clear separation of powers where the king, priests and prophets all served to kept each other in check. In Israel – the power of the king was not absolute. Everyone ultimately was responsible to God. The basis of the law was a covenant relationship with God and the people. Moses wrote laws and then connected them with what God had done for the Israelites in the past. He wrote how they had once been aliens and that God had taken them out of Egypt. Thus, they were to be careful how they treated aliens living in their midst. The fact that the laws came from God and reflect His principles also served to remind the people that they were accountable to God. There existed a sense of reciprocity. God would one day judge them for their actions. Moses issued a divinely orchestrated social order that Israel was supposed to implement as God’s people – a light to the nations. Just like the Israelites, the founding fathers of America talked about God as the giver of human rights. Although not all of these men were Christians, most of them had a belief in God and recognized the centrality of God to forming a just society. The Archbishop of Canterbury recently created a stir in Great Britain by suggesting that some elements of Sharia law should be recognized in the British legal system. I had never heard of Rowan Williams until today. The first thing that I noticed is that I liked his accent. Actually, I covet it. I wish that I sounded as smart as he does. Williams made some interesting points. I agree with his major premise that some elements should be recognized. For example, marriage ceremonies by imams, private dispute resolutions according to Islamic traditions, etc. This would only be allowed in non-criminal matters. All parties would have to agree to it, and the decisions and practices could in no way violate existing laws. Thus, a Muslim couldn’t insist on Sharia principles without consent of the other party and in full alignment with existing British law. Anything beyond that, I believe would be harmful for British society and would make tensions worse between the various ethnic groups in that country. If Muslims don’t like those apples, they can move to Iran, Egypt or Saudi Arabia. Of course, any accommodation to Sharia principles would have to be approved by parliament and upheld by the courts. I can sure see how the thought of even a tiny bit of Sharia law would cause concern for the average Brit. Most people hear the term Sharia law and think of stoning, beheading and belittling women. The archbishop was not arguing for those things. Sharia law might even seem like an oxymoron for some Westerners. I know that I think of Taliban rule and many fundamentalist Islamic practices as barbaric. Yet, there are some moderate aspects of their tradition that could fit into Western legal systems. In places where harmonization can be reached, we should attempt to find solutions so that we can all live together. Of course, I would draw a line that preserves the rights of non-Muslims. While Muslims can practice their religion, it should never infringe on the rights of others not to practice it. For example, I would not allow the call to prayer to be broadcast in public except over a radio station or other non-intrusive methods. The above statements were made by James Cameron during a news conference held a few months ago. Cameron, an Oscar-winning director was promoting a documentary about the discovery of the alleged tomb of Jesus Christ that he produced. 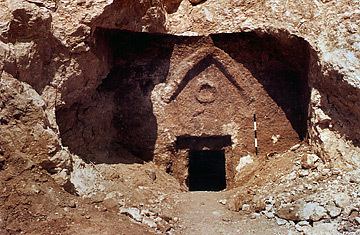 The film, The Last Tomb of Christ, caused a lot of controversy by both religious leaders and scientists. Regardless of what you thought about the film, Cameron’s above comments hit on a key of Jesus’ life. He has impacted history in a way that no one else has. His message caught on, and the world has never been the same. Not that I need Hollywood to validate Jesus. But it sure is nice to see that the world recognizes what many Christians have forgotten – Jesus’ life makes all the difference. Merry Christmas to all my family, friends, church family, co-workers, business associates & even complete strangers! 2006 went by quickly, and I am overjoyed to have shared so many great moments with so many of you. To those friends and family that I have not interacted with over the past year, please know that I hold many precious memories in my heart. And I hope that you are all doing well. So what’s the latest with me? Well, I finished my second book. Titled Starving for Hunger, the project is in the final editing and production stages. It should be ready for delivery by early 2007. This is my first e-book; it will be available on CD and for download from my Web site www.organicfaith.com. Starving for Hunger explores spiritual hunger and desire. This e-book delves into why it can be so hard to discover God’s best while living in American society. It is a wakeup call to the American church and will be sure to challenge anyone who reads it. In February, I had the opportunity to go on a business trip that took me to North Eastern Canada. The temperature reached nearly 20 below zero. I have never witnessed such snow or cold temperatures in my life. The mill tour included a full day of snowmobile riding. That was a blast. This summer marked a season of transition as many of the students that I had grown close to over the last few years graduated from high school and went off to college or other parts of the world. It was weird and a bit sad to say goodbye. I am blessed to have had the opportunity to show so many great young people just a bit of what it means to live like Jesus. In August, I had the opportunity to teach a short course on Walking Where Jesus Walked. The class was intended to be a primer for those going on a missions trip to Israel in the fall. It became a great opportunity to research details about the life of Jesus and then share what I had learned. The class was a hit, and I enjoyed it a lot. After the class, came the actual mission trip to Israel. In many ways, this was the highlight of my year. I thought it was going to be primarily a spiritual pilgrimage. But God had others plans as I had the opportunity to minister to those on the team, Christian missionaries in Israel, and even complete strangers. From baptizing a fairly new Christian in the Jordan River to interceeding with thousands of other Christians for Israel to teaching on the Mount of Beatitudes, it was an incredible experience. If you ever have an opportunity to go to Israel, I suggest you take it. The land is full of history and spiritual lessons that we should learn from today. You can find out more about this trip by reading my trip journal, which should be posted online by mid-January 2007. On a more recreational note, skiing has become a recent passion for me. I have gone a number of times this year and am getting ready to head to Mount Tremblant in Canada. There is no place like the mountains to experience God’s majesty and power. The Lord continues to bring people in my life, and I am learning from each relationship what God wants me to see. I am still believing that God has a wife out there for me, and I pray for her regularly. The Brindley family is all doing well. This includes me, my parents, my brother and his family. For many of you, it has been far too long since we talked. I hope to hear from you soon. May God bless and guide you in 2007. May you experience the joy of living for God’s glory and His kingdom.